We are parents- members of the Alamosa Park Elementary community. We are volunteers dedicated to supporting our students and our school. Who are we? We are you! Traditionally, Alamosa Park Elementary was very lucky to have 2 unique parent groups working together to support the school: 1 being the PTA, and the other being the Alamosa Park Education Foundation. Starting in the 2018/2019 school year the members of both Parent Groups have combined to create a super group of hardworking and fun loving parents dedicated to supporting Alamosa Park Elementary School, We are a non profit organization committed the students, teachers, and staff of APE! The Alamosa Park Education Foundation was established in 2008 by a group of parents focused on improving our school. 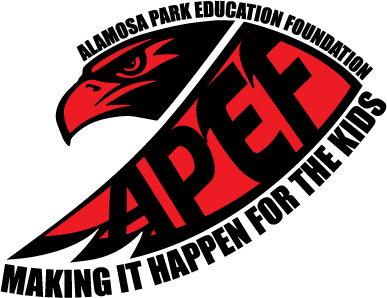 The APEF is a group of parents and staff who are dedicated to enriching Alamosa student's educational experience. We raise money to support our Scrabble Club, Garden Club, Millionaire Reading Program, and after school enrichment programs. We sponsor the bi-annual Hawk Run which has raised over $100,000 to date! Every single cent has gone to purchasing materials like iPads and ChromeBooks for each student; or SmartBoards for each classroom. Our group has purchased playground equipment, PE equipment, and has sponsored sports programs like the Track Team and Intramural sports. We support our teachers and help them with classroom supplies. We also provide grade level grants each year so students can take part in field trips and other enrichment experiences. We support our music program, art programs, science programs, Maker Space and Coding Labs- ensuring that each student is exposed to a well rounded education. This years Hawk Run pledges will be used to support our music and PE programs as well as provide the funds necessary to upgrade the current technology for our school; as well as provide funds for creating Independent Learning Spaces on campus, and multi-media and Makers Space labs to support whole child learning. We sponsor fun community events, like The Father/Daughter or Mother/Son events, Winter and Spring Choral Concerts, The Fall Festival, and The End of the Year Campout! These events bring our community together and enhance each student's elementary school experience. Plus- they are a lot of fun for the whole family! We also raise money through Box Tops, Dine outs, Rummage Sale, Year Book and Square One Art.